I bet you know what the tenor of this post will be, just by the quote. I really quite dislike pronouncements on high from fashionistas and theorists – whose JOB it is to sell change – that what I have or look like is no longer good enough. Jeez. This is the third year in a row I’m having a little ‘stamp my feet” session about this particular peeve. I’m talking about the PANTONE® Fashion Colour Report, of course. These are the women's colours. 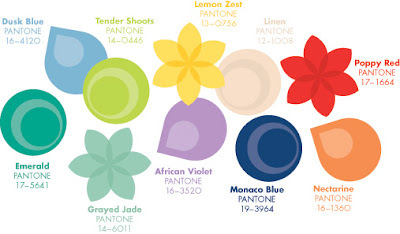 Pantone’s newest colours, for Spring 2013, were released September 6, 2012 to coincide with New York Fashion Week, I believe. May as well get all the hot air expelled at once, eh? Perhaps you can tell that I’m not the greatest fan of all this. I don't mean to lay all the blame at Pantone’s feet. I love Pantone. I use their inks in my professional practice. I guess I don't like them using their world-dominant position to peddle change for change's sake. I don't know why Pantone's Spring colours always get me so fired up. But it does. Perhaps it's because it is such an obvious example of what's intrinsically wrong with us. There’s many people who feel the urge to pontificate about the changes in the seasons. In times past they were called soothsayers (or witches...). Today we call them fashion theorists. I guess what gets up my nose the most are two things: first, that I’m being told that if I don’t follow the latest trend I am somehow passé. If not overtly told, surreptitiously. were different from each other. The second goes much deeper. It strikes at the heart of our society: superficiality and disposability. We have built a culture on obsolescence and perpetual consumption that we cannot sustain. Of course it’s not the fault of some colour standards people. But what they do is an outward sign of our societal rot and decay. There is nothing wrong with innovation or profit, but I do have a problem with profit for profit’s sake. A big problem. I think that profit should be the well earned result of supplying something beneficial/effective/workable/good that is needed by a society. The cream rises to the top. Do not confuse need with want (or cream with something else that floats). It seems that we now manufacture need where it does not exist, nor should. The business I am in shoulders a lot of the blame. The newest piece of electronic claptrap (or whatever) is marketed so fiercely (and well) that need is created – out of whole cloth. We have actually created such a science around "want" that we can use it to analyze our success. So where do we go? I don’t know, but I bet it isn’t upward. Can we ignore these attacks on our ability to think for ourselves and live our lives as before? Of course. Unfortunately it's extremely difficult to ignore, and there are those who just can’t (or don't know what's being done to them). Last year I wrote that often these missives become self-fulfilling. If enough people decide to follow a proposed "trend" then, yes, it becomes a trend. Like rolling a rock down a hill, it gains its own momentum. This kind of stuff leaves me mentally exhausted and morally anxious. Where’s a cave when you need one? By the way, in case you’re interested, the “Colour of the Year” is..........are you ready........... Emerald green. Earth shattering. And me with no emeralds. To view the entire proclamation in Press Release form, visit the belly of the beast here. There. I feel a bit better. How about you?